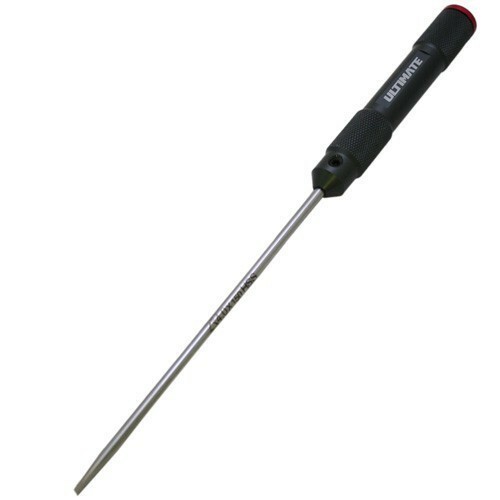 This is the Ultimate Racing Flat Screwdriver 4.0x150mm. It features an ultra-lightweight and ultra-durable machined aluminium handle with a non slip surface that will be comfortable to use during long wrenching sessions. The handle is supplied with the Ultimate logo engraved and a blank free space to engrave your name. A red anodized cap is fitted to the end to help the tool easily rotate in your hand and increase comfort during use. The tool type/size is engraved on the cap for easy identification. The hardened steel tips are precision designed to provide an exceptional fit with the fastener, long life, and unbelievable torque.